The original "The Harvest", may have been probably woven in Paris in Lin Tournai in the XV century. This remarkable representation of the grape-gathering and the wine-press on a millie-fleures background, hangs in the Cluny Museum in Paris. 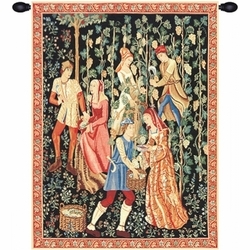 This tapestry has been reproduced with Flemish cartoons from about 1535, in wool, silk, gold and silver threads. Gently vacuum every 6 months. Dry clean only- when required.